iGNITE is the main PTO fundraiser. No benefit nights or wrapping paper sales, just a suggested donation of $125 per student. These experiences are an integral part of educating the whole child and your contributions go right back to your kids. In recent years, classes have visited a variety of museums including Adler’s Planetarium, Chicago Botanic Gardens and Shedd Aquarium to name a few. Students have also heard from leading edge speakers including Ruby Bridges (first African American to attend an all-white school) and Mike Byster (a mathematical genius featured on 20/20) who taught our students and teachers innovative math and memory short cuts. iGNITE also hosts an author each year to visit Harper School and share their craft with the students. Programs and activities are developed by grade level and and not all grades participate in all programs. Programs and activities also evolve each year. 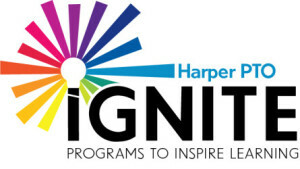 Drop off a check in the iGNITE folder in the Harper Lobby. Please make the check payable to Harper PTO and include your child’s name on the check. The suggested donation is $125 per child enrolled at Harper.